A high performance distributed elaboration structure based on the Next Generation Grid principle. 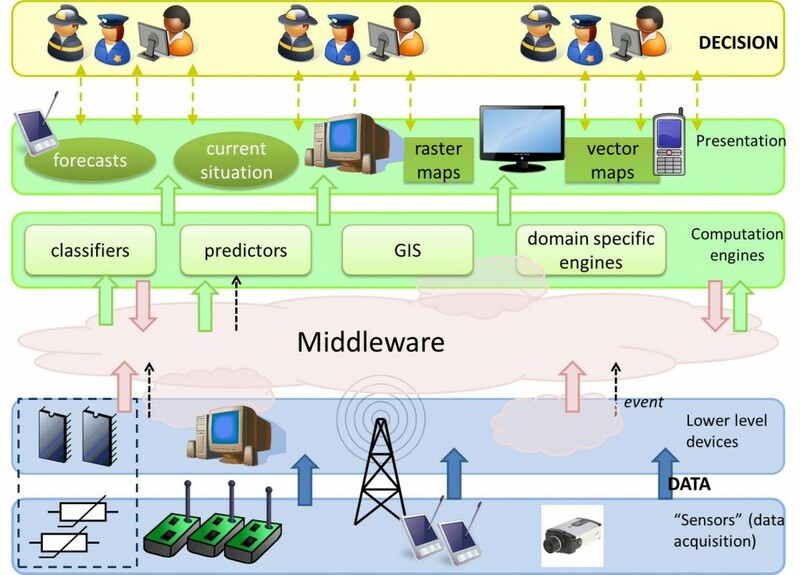 The system foresees the functional integration of new technologies with actual or off-the-shelf technologies and allows a synergic coordination among different operators working on emergency management (institution, local administrations, volunteers), in order to optimize the emergency responses and the use of available resources. One of the missions of In.Sy.Eme is to identify a robust and flexible telecommunication infrastructure that allows integrating different informatics technologies for the development and use of specific applications. This will require identifying new solutions, suitable for specific contexts of interest, able to increase both efficiency and reliability of information transmissions in harsh communication channels and to guarantee the Quality of Service (QoS) to different applications. In.Sy.Eme aims also at defining an innovative methodology and technology for both the architecture and programming model of the distributed platform supporting emergency management applications. The guidelines for the architectural and programming model derive from the requirements identified by Domain Abstraction and Communication Technology. System resources are managed dynamically, and software components are deployed dynamically onto the system resources. Adaptivity and context-awareness are fundamental features of the architecture and of the programming model; to design adaptive and context-aware strategies, a proper visibility of the system layers is necessary (with sensible differences compared to traditional, general-purpose systems based on the concept of “opaque layers”). Architectural reflection and spatial contextualization are fundamental features of the model. This principle is strongly related to adaptivity and context-awareness, because the application management strategies are often fired by “contracts” that are dynamically established between entities at different layers; portability, which of course is a general feature of any component technology, in our case must address explicitly the issue of dynamic deployment and adaptivity of application components on several and extremely different and heterogeneous kind of resources (general servers, dedicated nodes, mobile devices, and so on). A major goal of In.Sy.Eme is to reduce the semantic gap between the requirements produced (“Reference Scenario) and the methodological and technological instruments of the “Communication Infrastructure” and the “Mobile Grid”. This implies, first, to analyse data flows and transformations for useful information; second, to identify domain-oriented abstractions that are significant both for the user and for system management activities; third, to recognize how advanced technologies can enable cost-effective services. The complexity of the information flows and the amount of the managed information require the support of knowledge discovery and forecasting techniques, which rely on models that are dynamically built and can be exploited in a distributed environment. This is the subject of Task “Models for Knowledge Discovery and Forecasting”, which is focused on the modelling of the different phases of the information flow and on the definition of the algorithmic components at the different levels, using mathematic-probabilistic modelling techniques. The development of a context-aware system turns into the identification of abstractions that do not depend on architectural and technological solutions but can turn into design specifications, by considering also that reflective meta-information about the system itself must emerge at the application level. 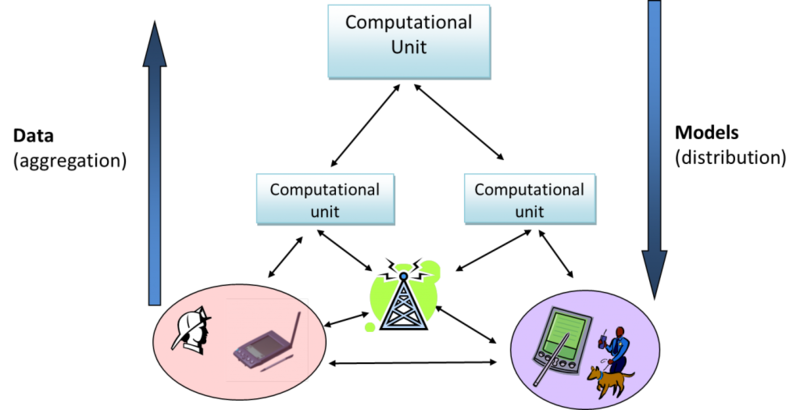 This is the subject of Task “Domain Abstractions Definition”, which is focused on the identification of the domain abstraction that must be visible at the user and application level. Finally, In.Sy.Eme includes the study and development of enabling technologies aimed at effectively supporting the domain abstractions, which is specifically focused on context-based routing and energy harvesting in environments that are characterized by high distribution and mobility.